Burnley’s high tempo game hasn’t come with a compromise on discipline - they play hard, but fair. While much is made of the Clarets’ fitness levels - having outrun every side they have faced so far this season - Sean Dyche’s men also top the Premier League’s Fair Play League. With the possibility of a place in the Europa League should Dyche’s side maintain their standards, and the Premier League finishes as one of the top three leagues in UEFA’s overall standings, the Clarets top the table ahead of West Ham, and have also failed to collect a single booking for dissent all season. Ahead of tomorrow’s home clash with Crystal Palace, Dyche, schooled under Brian Clough at Nottingham Forest, admits he won’t tolerate talking back to officials: “My players know they mustn’t speak back to referees, because I’d tell them off – and that’s a conversation they don’t want to have. “I know it’s not always easy. I get frustrated sometimes on the sidelines – I was frustrated by some of the decisions at Spurs, and if I’m honest I was quite surprised by some of them. “But reacting to those things is not going to change anything. “And I tell the players that it’s harder sometimes to keep it in as a manager than as a player. He added: “They know how I feel. I just don’t think dissent is necessary from my players, and I’m pleased they don’t show it. They might question the ref occasionally, but they don’t do it in a manner that will get them in trouble. 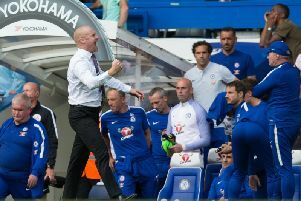 Ultimately, cheap bookings for back chat can also lead to suspensions, which Burnley can ill afford, and Dyche explained: “We’ve got the same mentality about the way we want to play the game. “If you get booked for a bad tackle then ok, that sometimes happens, but don’t make a habit of it. “We do try to play in a hard but fair way. Meanwhile, Dyche expects to have Kieran Trippier and skipper Jason Shackell available to face the Eagles tomorrow: “Kieran came off (against Spurs) with a tight hamstring but will be okay. “Shacks has made reasonable progress, we are expecting that to be okay.